We’d love your help. 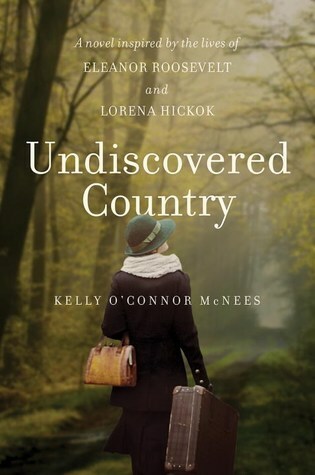 Let us know what’s wrong with this preview of Undiscovered Country by Kelly O'Connor McNees. In 1932, New York City, top reporter Lorena “Hick” Hickok starts each day with a front page byline―and finishes it swigging bourbon and planning her next big scoop. But an assignment to cover FDR’s campaign―and write a feature on his wife, Eleanor―turns Hick’s hard-won independent An extraordinary novel portraying one of the greatest untold love stories in American politics. But an assignment to cover FDR’s campaign―and write a feature on his wife, Eleanor―turns Hick’s hard-won independent life on its ear. Soon her work, and the secret entanglement with the new first lady, will take her from New York and Washington to Scotts Run, West Virginia, where impoverished coal miners’ families wait in fear that the New Deal’s promised hope will pass them by. Together, Eleanor and Hick imagine how the new town of Arthurdale could change the fate of hundreds of lives. But doing what is right does not come cheap, and Hick will pay in ways she never could have imagined. To ask other readers questions about Undiscovered Country, please sign up. UNDISCOVERED COUNTRY is actually the third fictional account I have read about Lorena "Hick" Hickok and Eleanor Roosevelt. And, I would, without any problems, read at least three more. I find both women fascinating to read about and I like reading new books that take a different look at their relationship. I adored this sensitively-written novel. McNees is a master of historical detail, and Eleanor and Lorena come alive in this tender story of love and friendship, hope and heartbreak. The stakes couldn't be higher for Eleanor and Lorena, making this page-turning story of forbidden love so bittersweet. Highly recommend. Kelly O'Connor McNees is simply a beautiful writer. I have adored all her novels and have eagerly been awaiting the release of Undiscovered Country. She has a way of capturing characters and setting that stay with you long after you've turned the last page. I can't wait to see what she does next! I would love to read a book about Eleanor and Hick that a) was actually about their romance and b) in Eleanor's POV. The second one is personal preference, but I am reading these books because I got interested in Eleanor, so they're not really scratching that itch. The second one . . . they got together SO QUICKLY. And Hick was pretty much out, but was it really that easy for Eleanor??? I wanted some actual falling in love! Oh, and Queer + Historical for Ripped Bodice bingo. A great look behind the curtain at a relationship that has not been covered extensively. I love the perceptive writing of Kelly O'Connor McNees and the empathy she feels for her characters; I also have always been fascinated by Eleanor Roosevelt but knew almost nothing about her love story with Lorena Hickok until I read Kelly's novel. How richly she writes the story, whether telling of smoke-filled newsrooms, dingy hotels, strained White House dinners and guestroom luxury, naked starving children across America and or the affinity and love two very different women find with each ot I love the perceptive writing of Kelly O'Connor McNees and the empathy she feels for her characters; I also have always been fascinated by Eleanor Roosevelt but knew almost nothing about her love story with Lorena Hickok until I read Kelly's novel. How richly she writes the story, whether telling of smoke-filled newsrooms, dingy hotels, strained White House dinners and guestroom luxury, naked starving children across America and or the affinity and love two very different women find with each other. Eleanor, who had come from a wealthy home and dedicated herself to help the poor as her husband was elected President, and "Hick," who had grown up in the worse poverty and abuse to fight her way up as a reporter (and a woman reporter!) in the days of the Depression. Her friends are the guys in the newsroom and her dog; she is a hard drinker and had seen a lot of tragedy and grit. Eleanor, so much in love with this utterly different woman and so abandoned as a wife by her husband Franklin, is utterly idealistic and early on into her love affair with Hick, sketches plans for the day they can live together and never be apart. But though Eleanor (called "Nora") is deeply in love, she is followed everywhere by Secret Service men; if she and Hick have a few hours privacy together, it is a luxury. Eleanor's life is utterly taken up by her idealistic fight for the poor, and the quiet life she also idealizes with her reporter lover in one small house begins to appear as difficult to create in reality as is decent housing and food for a good part of desperate America. Both the determined reporter and the gracious First Lady are richly portrayed as if instead of opening the pages of a book, you are stepping into a life and watching fascinated from the corner of a room. Two great things are at stake: the future of millions of Americans in the grinding Depression, and the small intimate space and time to allow this love to flourish. How can they have what they so much want? How can any couple have it, so pulled by commitments and yet so deeply pulled together? A remarkable, deeply human book about two people in love and how they can make that love work in the reality of their world. Brava to the author! Superbly done! To be cherished on my shelf of books to read again. Imminently readable and relatable. I like when historic fiction makes me want to learn more about the actual historic figures in the book. After reading this novel, I wanted to learn more about Hick and her role in Eleanor’s life and Roosevelt’s White House. I highly recommend this book if you’re at all interested in the Great Depression, the Roosevelts, women in journalism, lesbians in the 1930s, or the domestic arrangements of the wealthy. It’s a solid read. Tender and heartbreaking love story. Loved the writing, only criticism is it went by too fast. There’s nothing wrong with this book, except that it can’t hold a candle to White Houses. Might return to it someday. This was compelling and readable, with an engaging first-person narrative. It would have benefited from a more historically accurate portrayal of the protagonist, Hick. The author left out some aspects of her work with the Works Progress Administration, such as attitudes and reportage that would now be considered racist and could have contributed to the inequities and even overtly racist policies of some New Deal programs. That said, this is a good book for introducing the concept of people deli This was compelling and readable, with an engaging first-person narrative. It would have benefited from a more historically accurate portrayal of the protagonist, Hick. The author left out some aspects of her work with the Works Progress Administration, such as attitudes and reportage that would now be considered racist and could have contributed to the inequities and even overtly racist policies of some New Deal programs. I started reading this very excited to learn more about Eleanor Roosevelt and her companion. While I found an interesting story, I wanted this story to span a wider time period or perhaps to be told from more perspectives. I didn't get closure from the book. There is so much information about Eleanor that I can see and understand the need to narrow the scope so I'm not sure how it could have been widened, but the book left me wanting to learn more about both of these real women and understand ho I started reading this very excited to learn more about Eleanor Roosevelt and her companion. While I found an interesting story, I wanted this story to span a wider time period or perhaps to be told from more perspectives. I didn't get closure from the book. There is so much information about Eleanor that I can see and understand the need to narrow the scope so I'm not sure how it could have been widened, but the book left me wanting to learn more about both of these real women and understand how their stories end. This was my first read about Eleanor Roosevelt. I learned a lot about what she did for the country with the help of Lorena Hick. At the end, I was disappointed because I wanted to know more about their relationship and also more about Eleanor's influence during her husband's presidency. I will continue reading about Eleanor Roosevelt. I didn't find any interview with the author, so I don't know how she did her research regarding the love letters and Lorena Hick. Eye opening book written about Eleanor Roosevelt and Lorena Hickok from "Hick's" perspective. They had a loving, physical relationship, as well as a productive working relationship, when Eleanor was the first lady. Eleanor and Franklin, it seems, had an open marriage, as well as 6 children. It was a surprise to me, as that seems to be skipped over in any American history books I read in school. Beautifully intelligent writing with a comprehension of the entanglements of the past with our present. This author has written characters that breathe off the page, characters who speak for themselves. There's a spark here that just might "engender the imagination that has so far failed us." I'd give this 2 1/2 stars if I could. I'm not a huge fan of biographical fiction - in this case the story of forbidden love in 1932 perhaps would have been more compelling if it hadn't been Roosevelt & Hicks. Have been working up to reading biography of Eleanor Roosevelt Pts. 1 & 2 & her autobiography so this was like an hors d'oeuvre. Interesting historical data while being a fictional imagining of her relationship with Lorena Hickok. This review has been hidden because it contains spoilers. To view it, click here. Didn't finish. The description was a little vague, or maybe I'm just dense, but these girl friends are more then friends😳.